Vertikalgående motordriven snabbrullport för transport och logistik i tillverkningsindustrin. Nordic 344-protec är en kompakt, motordriven snabbrullport för användning som maskinskydd framför t ex svetsrobotar i arbetsstationer eller över transportörer. Hög säkerhetsnivå med beröringsfria givare kategori 4 för förregling av roboten. Kan förses med integrerad fotocellridå i karmarna. Motordrivna snabbrullportar med kraftiga vävportblad för användning invändigt/utvändigt som fasadportar, lagerportar, slussportar, sågverksportar, maskinskydd m m.
Nordic 1000 är en motordriven snabbrullport med kraftigt vävportblad för större öppningar invändigt/utvändigt som t ex fasadport, lagerport, slussport, tvättport. Max yta 30 m². Nordic 350 är en motordriven snabbrullport med kraftigt vävportblad för användning som bl a lagerport, kylrumsport, butiksport, tvättport, bullerskyddsport m m. Finns även som ESD-port (fri från statisk elektricitet). From ASSA ABLOY Entrance Systems, the Albany RR200 offers aesthetic opportunities that go beyond the norm with a curtain that can be custom printed, allowing the door to virtually disappear into its surroundings. 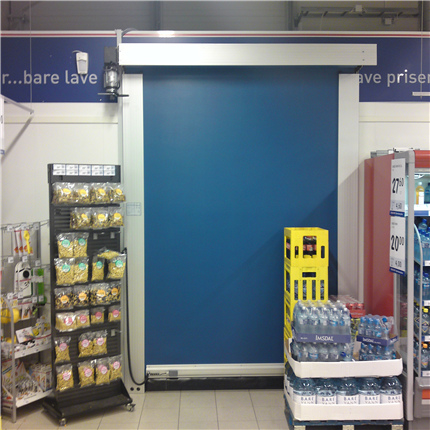 This innovative high speed door allows personnel to move safely and quickly between helping customers and accessing private areas, streamlining the movement of staff and goods. 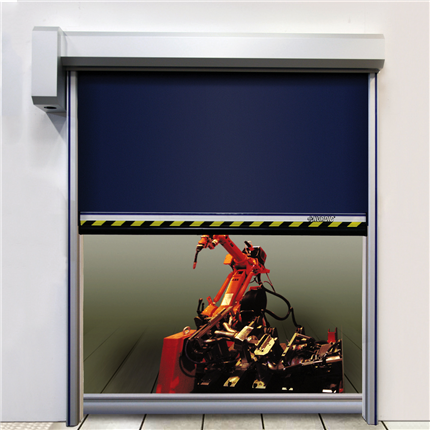 The Albany RR500 is a reliable, wind resistant, sealed, high-performance door for interior and exterior applications. 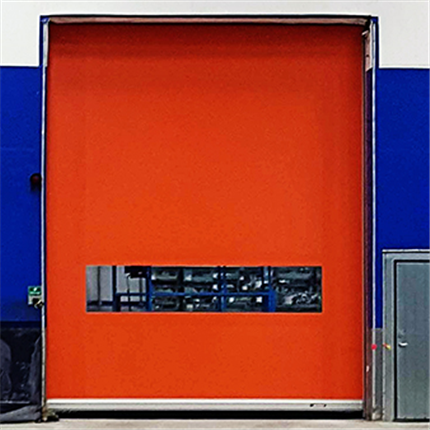 The door is ideal for large openings up to 8000 x 5500 mm typically found in industrial and logistical environments. The Albany RR500’s unique Zipper Technology features a link system between the curtain and side columns, which is designed to release and automatically repair in the event of a crash. The door comes with a variety of curtain options and all in all offers high reliability and low maintenance. From ASSA ABLOY Entrance Systems, the Albany RR300 is the most versatile high speed door on the market. This single product can be easily customized for a range of interior applications – high traffic areas, clean and hygienic spaces, high pressure zones and much more. From ASSA ABLOY Entrance Systems, the RR3000 XXL can be found in use wherever busy, large doorways are needed. This brilliant fast running door opens at high-speeds, even in doorways up to 6 m high. A special winding mechanism (Disc DriveTM) allows the door curtain to be wound without noise or wear. The flexible slats in particular offer a great benefit in daily use. They protect the door against possible collision damage and also provide noise insulation. The contactless photocell provides the necessary safety. The Albany HS9010PEM from ASSA ABLOY Entrance Systems is designed as an interior high speed roll up door for heavy-duty operations combined with an emergency exit. An ingenious T-shaped cut, retained by zippers in the middle of the curtain allows the two symmetrical "flaps" to release an emergency exit, simply by pushing at the indicated release point ("Push Here in case of an emergency"). The Albany HS9020GHY from ASSA ABLOY Entrance Systems is designed for interior applications in humid or corrosive environments, and in the food industry where hygiene demands are high. It offers perfect sealing thanks to a unique design. The Albany HS9020GHY requires very little space and protects your environment against drafts, humidity, dust and dirt. The operating speed combined with its sealing properties improves your traffic flow, provides employee comfort, and saves energy. The Albany HS9030GHY from ASSA ABLOY Entrance Systems is designed for interior applications in humid or corrosive environments, and in the food industry where hygiene demands are high. The door offers perfect sealing thanks to a unique design. The Albany HS9030GHY requires very little space, and it is the most space-efficient high speed door available in the market. The operating speed combined with its sealing properties improves your traffic flow, provides employee comfort, and saves energy. The Albany HS9110P from ASSA ABLOY Entrance Systems is an evolution of the Albany HS9010P. It is designed for medium-sized heavy-duty operations in interior environments. It protects your environment against drafts, humidity, dust and dirt. With fast opening and closing speed, the door improves your traffic flow, provides employee comfort, and saves energy. 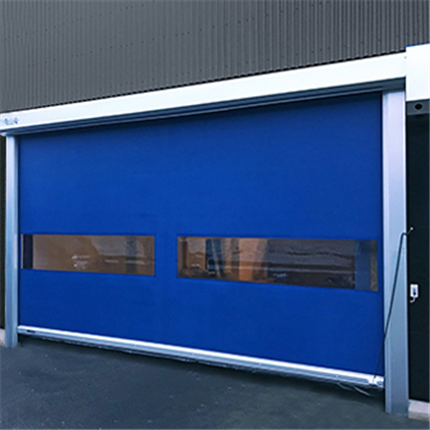 The Albany HS8020P from ASSA ABLOY Entrance Systems is designed for exterior openings in medium-sized heavy-duty operations with extreme wind loads. It protects your environment against drafts, humidity, dust and dirt. With fast opening and closing speed, the door improves your traffic flow, provides employee comfort, and saves energy. The Albany HS9030GAT from ASSA ABLOY Entrance Systems is a compact, airtight door with integrated motor suitable for cleanroom environments. The door offers perfect sealing thanks to a unique design. The Albany HS9030GAT requires very little space, and it is the most space-efficient high speed door available in the market. The Albany HS9030GEM from ASSA ABLOY Entrance Systems is a high speed roll up door combined with an emergency exit for inside environments. An ingenious T-shaped cut, retained by zippers in the middle of the curtain allows the two symmetrical "flaps" to release an emergency exit, simply by pushing at the indicated release point ("Push Here in case of an emergency"). The Albany HS8010P from ASSA ABLOY Entrance Systems is designed for exterior openings in medium-sized heavy-duty operations. It protects your environment against drafts, humidity, dust and dirt. With fast opening and closing speed, the door improves your traffic flow, provides employee comfort, and saves energy. The Albany HS8010PL from ASSA ABLOY Entrance Systems is designed for exterior openings in large-sized heavy-duty operations. It protects your environment against drafts, humidity, dust and dirt. With fast opening and closing speed, the door improves your traffic flow, provides employee comfort, and saves energy. The Albany HS8020PL from ASSA ABLOY Entrance Systems is designed for exterior openings in large-sized heavy-duty operations with extreme wind loads. It protects your environment against drafts, humidity, dust and dirt. With fast opening and closing speed, the door improves your traffic flow, provides employee comfort, and saves energy. The Albany HS8110P from ASSA ABLOY Entrance Systems is an evolution of the Albany HS8010P. It is designed for increased longevity and comfort in medium-sized heavy-duty operations. It protects your environment against drafts, humidity, dust and dirt. With fast opening and closing speed, the door improves your traffic flow, provides employee comfort, and saves energy. The Albany HS9010PL from ASSA ABLOY Entrance Systems is designed for interior use in large-sized heavy-duty operations. It protects your environment against drafts, humidity, dust and dirt. With fast opening and closing speed, the door improves your traffic flow, provides employee comfort, and saves energy. The Albany HS9020G from ASSA ABLOY Entrance Systems is designed for interior applications. It offers perfect sealing thanks to a unique design. It requires very little space and protects your environment against drafts, humidity, dust and dirt. The operating speed combined with its sealing properties improves your traffic flow, provides employee comfort, and saves energy. The Albany HS9010P from ASSA ABLOY Entrance Systems is designed for interior use in medium-sized heavy-duty operations. It protects your environment against drafts, humidity, dust and dirt. With fast opening and closing speed, the door improves your traffic flow, provides employee comfort, and saves energy. The Albany HS9010PFR from ASSA ABLOY Entrance Systems is designed for freezer environments, allowing efficient traffic flow while minimizing temperature variations. The high operating speed combined with an excellent seal optimizes the internal traffic flow and provides energy savings. The door can be set to open automatically every 20-25 minutes to avoid build-up of ice on side-guides and curtain. The Albany HS9020GAT from ASSA ABLOY Entrance Systems is airtight and suitable for cleanroom environments. It offers perfect sealing thanks to a unique design. The Albany HS9020GAT requires very little space and protects your environment against drafts, humidity, dust and dirt. The Albany HS9030G from ASSA ABLOY Entrance Systems is designed for interior applications where sealing, aesthetics and space-limitations are important. With its modern design, the Albany HS9030G is most space-efficient model available in the market. The reduced door footprint on both sides of the door opening gives you approximately 300mm more selling space when compared to other doors. I december lanserar Schüco en helt ny generation skjutdörrar för att du ska kunna bygga större, smartare och ännu snyggare. Håll utkik efter ASE 60 & 80! Leverantören Demex utökar sitt produktsortiment med formstabila skyddsnät av plast. Sesam öppna dig - uppåt! Den nylanserade Sesamgrinden öppnar sig uppåt som en bom. Därmed kräver den mindre utrymme och ska vara enklare att montera i lutande infarter.